Joanna Ewa Glazer's paintings have been exhibited in solo exhibitions throughout France, in UK and Japan, including Joel Garcia Gallery in Paris, Espace Gaillane Gallery in Avignon, Mis a Nu Gallery and La Marotte Gallery in the south of France, Iceberg Gallery in Antibes (France); the Philharmonic Centre in Koide (Japan) and International University of Japan. 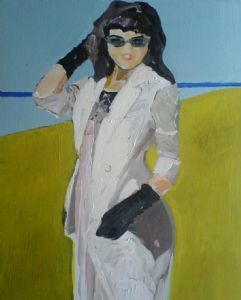 She has participated in many Art Fairs and group exhibitions including Affordable Art Fair in London, New York, Amsterdam, Paris, Fresh Art, selected by an art world panel, Chelsea Art Fair, Art on Paper, Grands March�s d'Art Contemporain in Paris and Brussels for many years, Museum of Western Art in Tokyo. In addition, she has been selected for the promotional design of the International University of Japan for 2 consecutive years as well as for the flyer of the Affordable Art Fair 2008. "The inner images and bold colours Joanna Ewa Glazer incorporates in her work convey a sense of abundance, total immersion into life and optimism. In her paintings, she creates a space of beauty and paradise in the way that shows resilience and strength regardless of circumstances. Each painting is like a poem., a life affirming experience." All her work is also about sense of identity, search for it and hints as to where to find it She finds her sources in fashion magazines, newspapers, books, art reviews, and advertising. Even a simple image in everyday newspapers may awaken emotion. Joanna Ewa Glazer has travelled and lived for long periods in numerous countries: Poland, France, Italy, Japan, USA, Belgium and UK. She was born in Gdansk (Poland)..